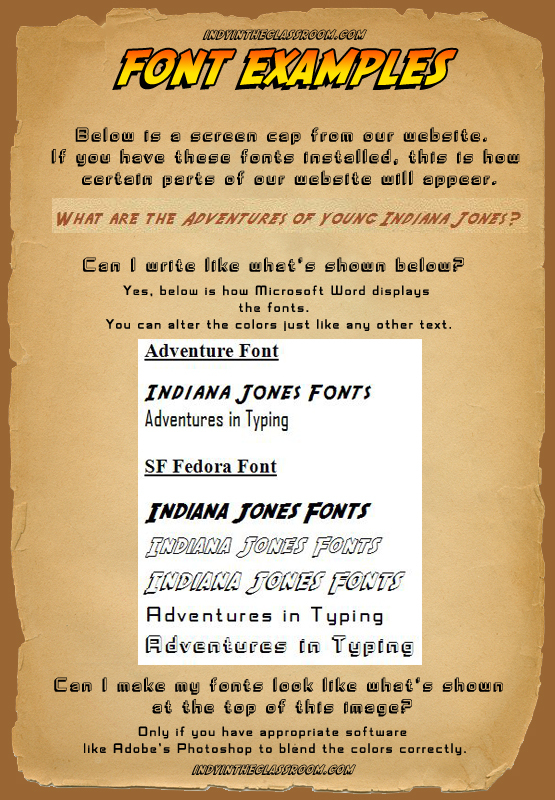 Did you know that much of our website appears in what is known as “Adventure” & “Fedora” fonts? For example, if you look above at the "fonts" heading above and it appears as normal text to you, then you need to install these “Indy” fonts. These fonts are designed to be used in most word processing software like Microsoft Word, PowerPoint, Publisher, etc. Click the image below to see examples of these fonts. Click here to see what you’re missing out on. Below are some websites where you can download these exciting fonts for FREE. Once you’ve installed them in your Windows ---> Fonts Folder our website will automatically appear as we intend. Still not convinced? Remember, you’ll also be able to incorporate these fonts in most word-processing software like Microsoft Word. Disclaimer: We expect these fonts to work appropriately if installed correctly. However, indyintheclassroom.com is not responsible for any damages caused as a result of installing the fonts listed above, nor are we responsible for the contents of the listed websites. We have provided websites that we have used, but we cannot guarantee their contents.